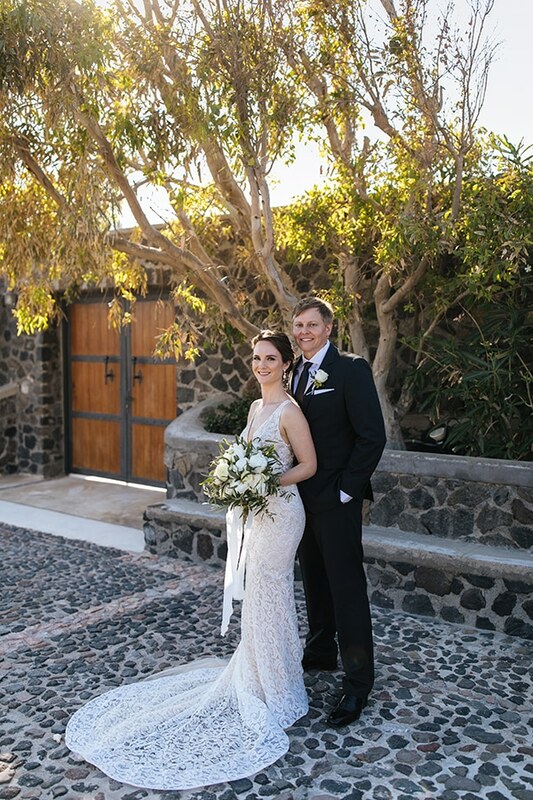 We are excited to share today a beautiful intimate destination wedding that took place at the breathtaking island of Santorini! 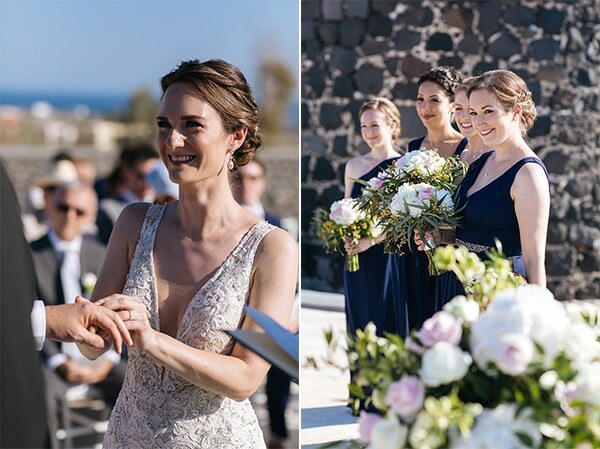 Rebecca and Stephen fall in love with Santorini on a trip and they realized it was the perfect place to hold their wedding! 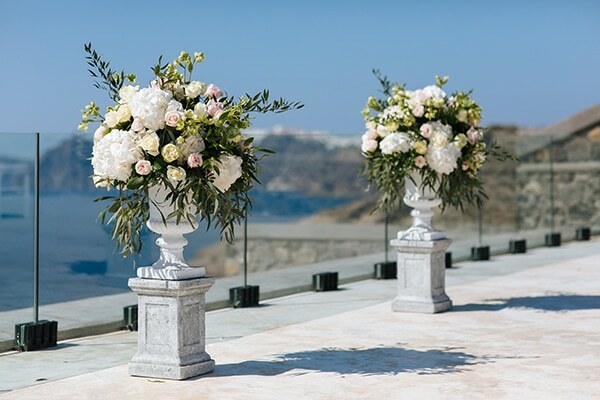 The lovely couple exchanged its vows at a venue with an amazing view which was decorated with beautiful flower arrangements with white and pink flowers and greenery! 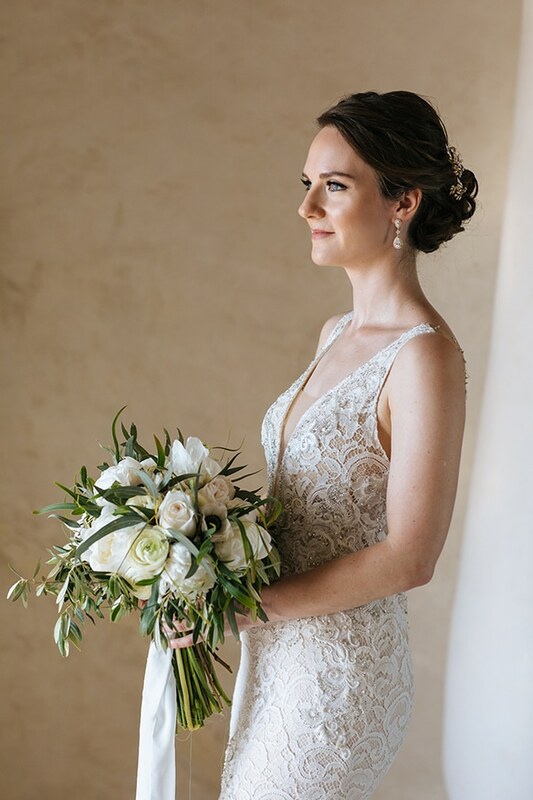 The bride chose a gorgeous embroidered lace Berta wedding dress with a plunging neckline and she was looking amazing! Love! 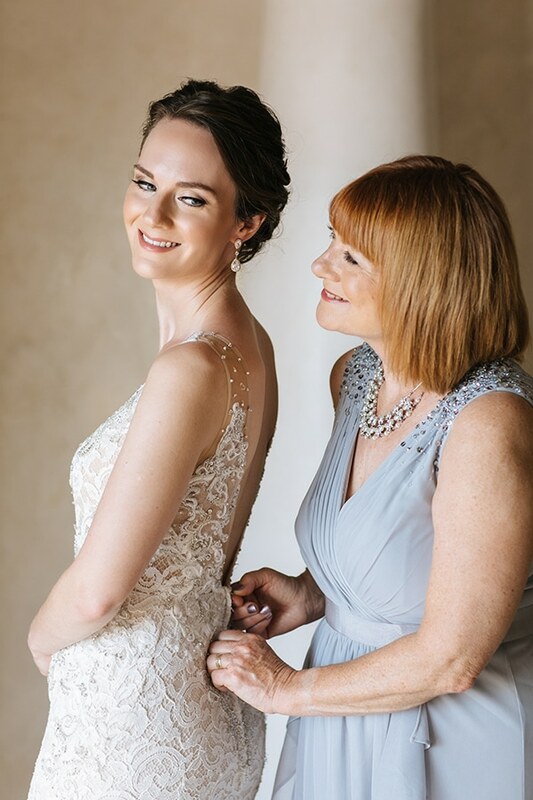 The bride shared with us: “We met through work and Stephen proposed on a trip to Las Vegas for my birthday, on a terrace at the Bellagio overlooking the fountain display. 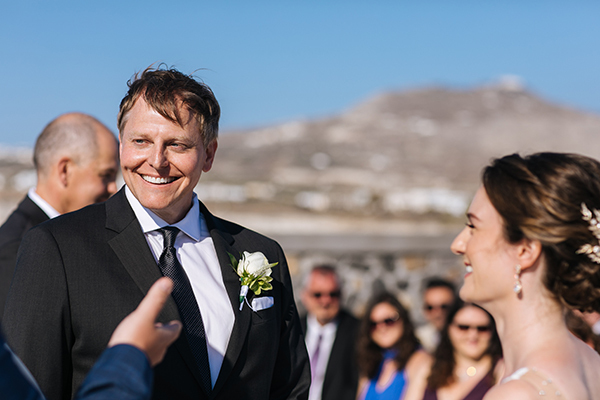 The ceremony took place at Cavo Ventus Villa (ceremony and drinks reception until sunset) and Theros Wave Bar in Santorini (dinner and dancing)”. 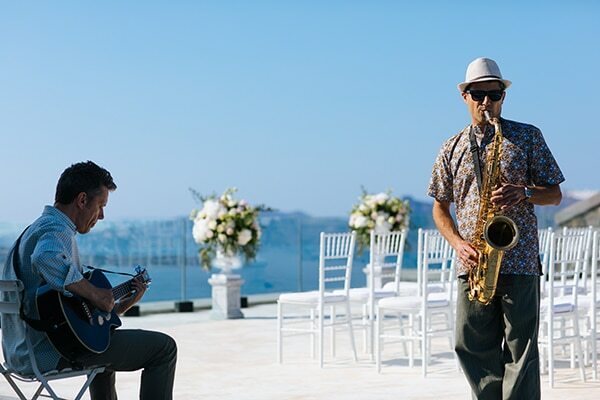 “What’s not to love about Greece? The natural beauty, the food, the weather, the friendly people and relaxed pace of life. 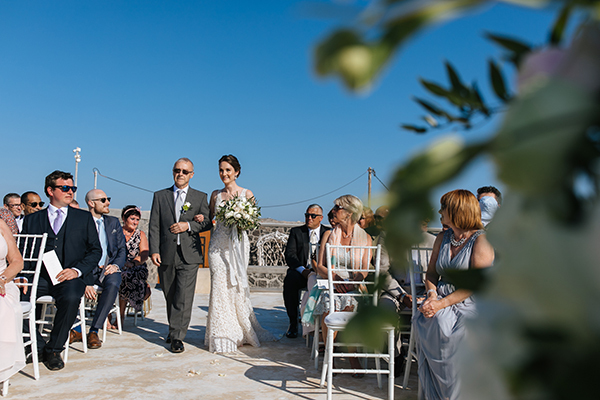 We had fallen in love with Santorini on a previous visit and just knew it was the perfect wedding destination for us and our friends and family”. 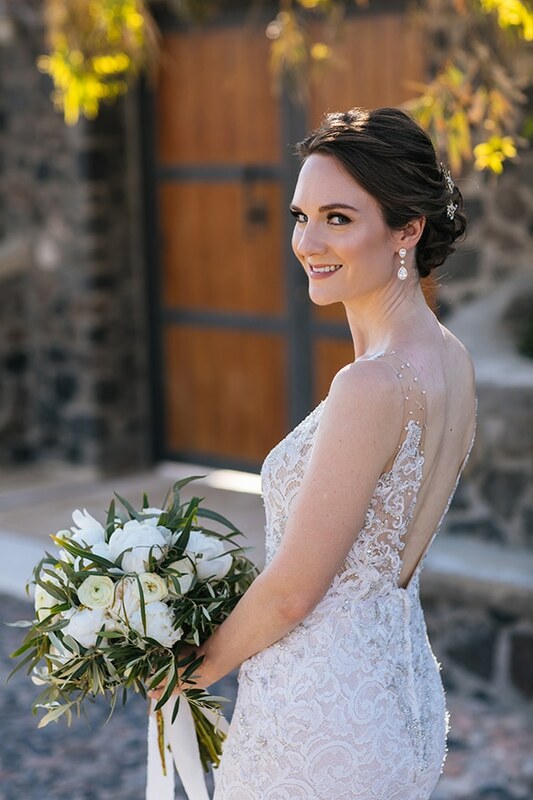 “I chose a Berta hand-embroidered and beaded, lace wedding dress with a plunging neckline, open back and beautiful train”. 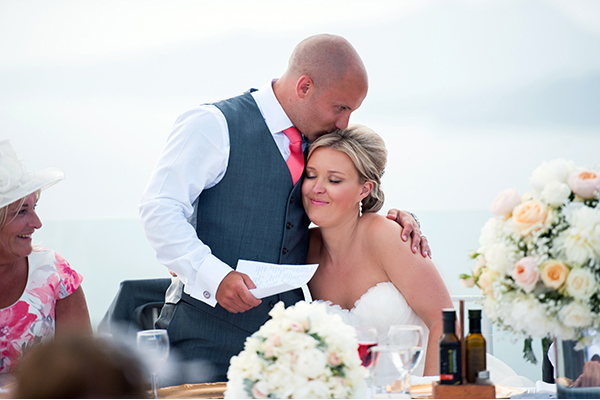 “Our chosen feel for the wedding was ‘relaxed elegance’. 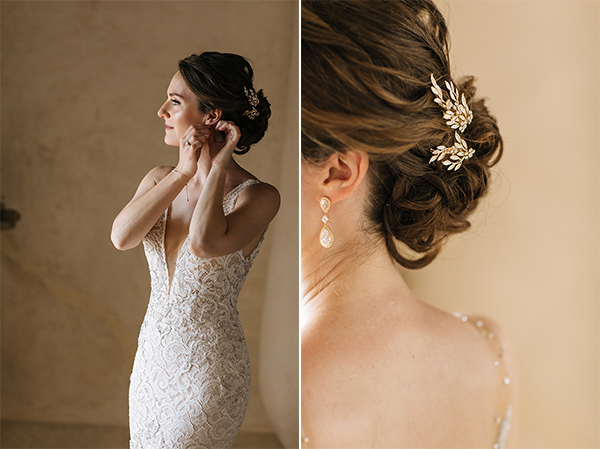 We wanted the day to be beautiful and timeless, but it was important to us that above all, the day was really fun. 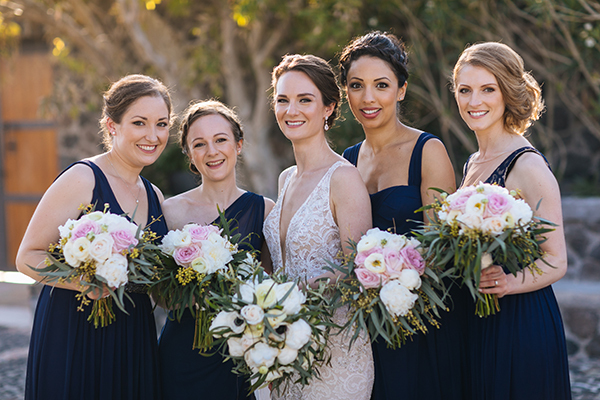 Our colours were a mix of whites and blush paired with a fun pop of pink, together with navy and gold elements to give an elegant feel”. 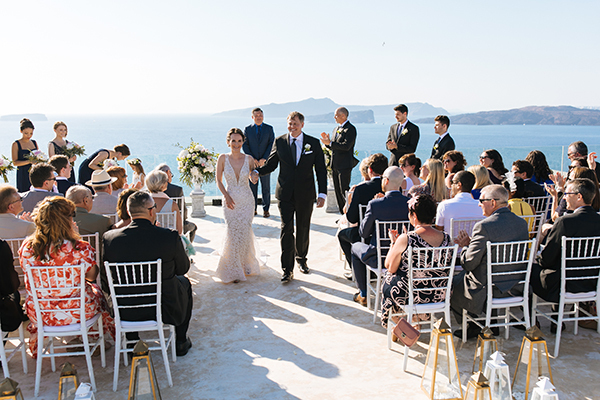 “We chose a venue with the most breathtaking view, which was by far our best decor! 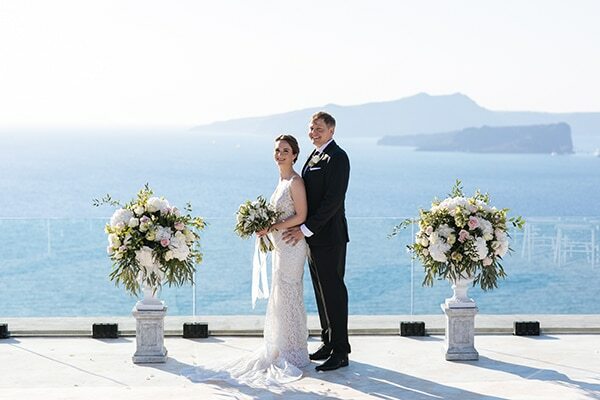 We decided against a floral arch for the ceremony, so guests could enjoy uninterrupted views, and instead Betty from Betty’s Flowers created the most beautiful, large floral displays that marked either side of the aisle”. 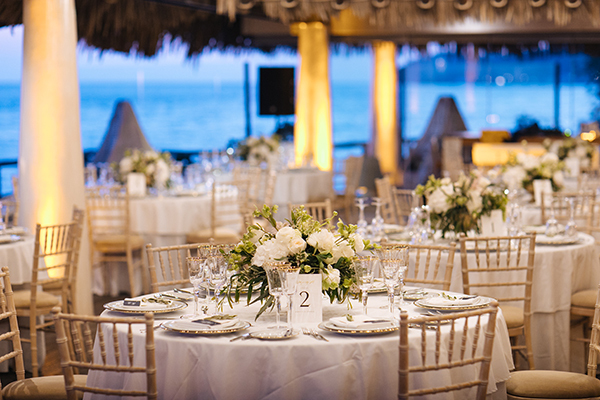 “For the evening meal, we had white tables paired with gold accents through rimmed charger plates and stemware and gold-leaf on our menu and table cards. 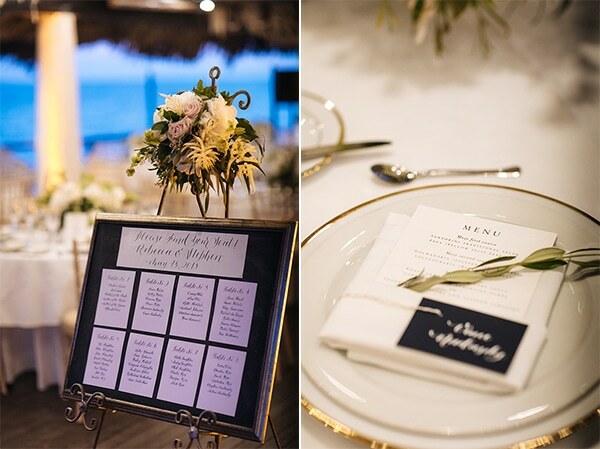 Each guest had their name hand-calligraphed on a navy blue place card and our planner, Evita from Santorini Glam Weddings meticulously tied an olive sprig at their setting. Betty from Betty’s Flowers created the beautiful floral centrepiece designs”. 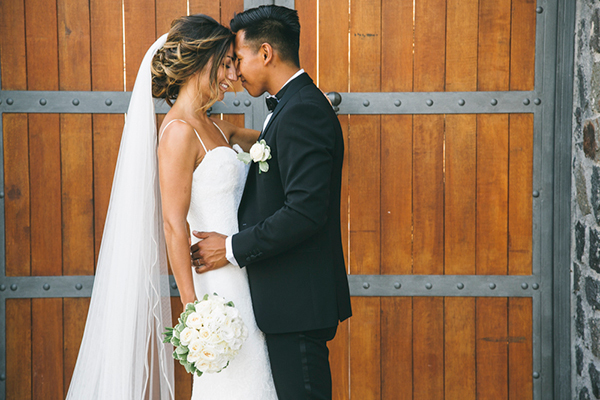 Bride’s advice: “People will remember your wedding for one or two main things and how they felt, so that should ground your planning. 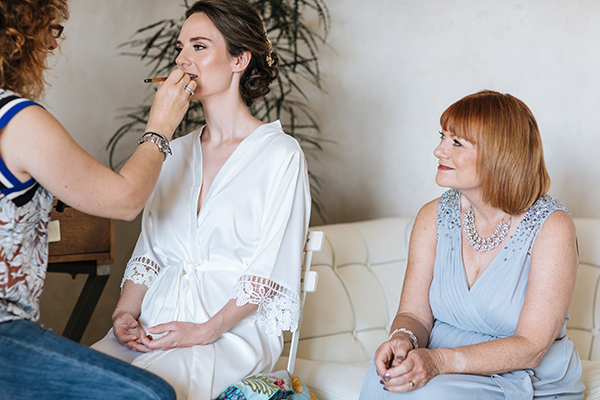 We wanted an unforgettable venue and for everyone to feel relaxed and able to have the best time. 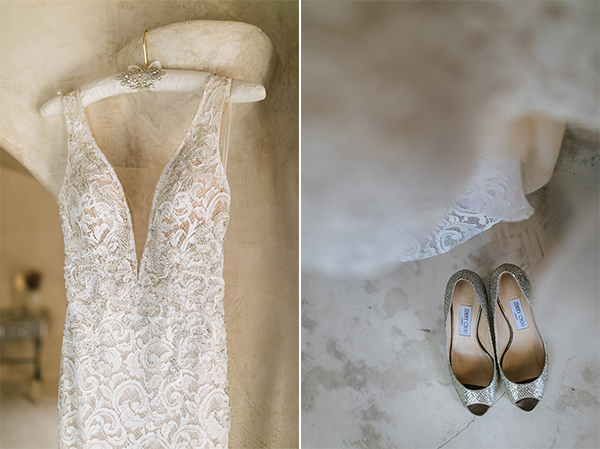 While so many details came into play for the wedding planning, we knew if we got those things right the rest would be the icing on the cake. 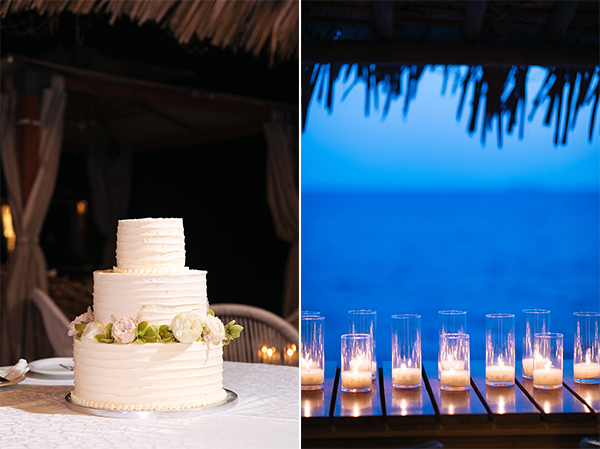 Wedding planning can be all-consuming, but on the day forget all of the planning, relax, and enjoy every moment”.